All models have 64 MB RAM and a PATA disk interface. Note that newer StorCenter models use an ARM CPU and are not supported. 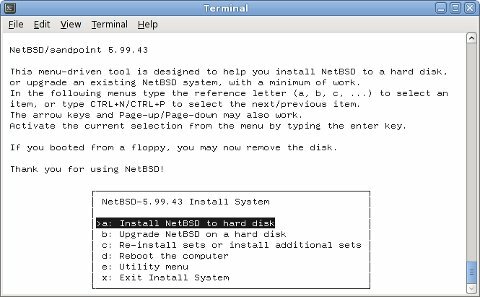 To install NetBSD/sandpoint you will have to open the case for getting access to the serial console. This is shown here for the Single Drive model. 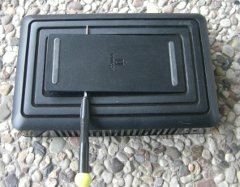 We need a serial console to get access to the firmware. That includes soldering a cable to the board and building (or buying) a serial adapter to convert from the StorCenter's TTL levels to RS232 levels. The Single Drive model is somewhat tricky to open. Move the cover by applying some force into the direction away from the interface bezel. It will eventually snap open. Then remove the metal shielding. Again, there are no screws. It is held in place by some brackets. Just pull it upwards and you will see the hard disk. Do not try to access the screws, which are securing the disk drive, through the plastic vents. To be able to pull the metal case up we have to remove four screws at the bottom first, which are hidden behind a plastic plate. Pry open the plastic plate using a levering tool, like a screw driver. You will need some force to do that. Remove the four screws at the bottom. Now you can easily pull the metal case out. 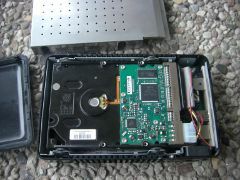 Remove the four screws which are securing the hard disk and unplug its connectors. Also remove the fan and the LED from the metal case. Now you can pull the mainboard out of the metal case, by moving it into the direction of the rear bezel. Look out for an unpopulated 8-pin header, called J11 (marked red on the picture to the left). The leftmost four pins can be used for the serial interface. The pin assignments are shown in the table. 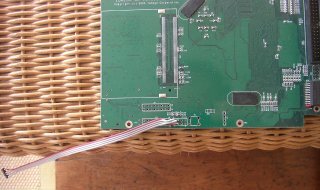 It is not recommended to solder a header onto J11, because then you would no longer be able to close the case. Instead you should just solder a 4-wire ribbon cable, which is flat enough to hide under the disk drive. Also make sure to choose a small 4-pin plug, which you can connect to your external cable with the actual D-SUB 9 connector. Alternatively you can cut a hole into the case. Make sure that the layout of the plug fits to the pinout of the StorCenter's serial header, as shown above. Provided the serial converter is installed and working correctly you should be able to connect to the firmware's serial console. 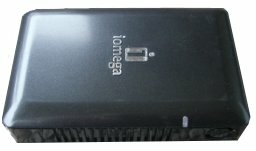 Iomega is using U-Boot, the Universal Boot Loader. Now you can connect with any terminal program to the StorCenter's serial console. The easiest approach may be to use NetBSD's tip(1) command to make a direct console connection at 115200bps. Note that when using a serial connection via USB you may have to make an entry for /dev/ttyU0 in /etc/remote. Immediately after switching your StorCenter on it will display the following information (output is from a Single Drive model) and gives you one second to stop autobooting. The altboot(8) utility functions as a bridge between the Iomega firmware and the NetBSD kernel startup environment. NAS firmware often provides no means to boot a kernel from disk or from the network and doesn't initialize all hardware correctly. We will also use it to pass a bootinfo list to the kernel. OpenPIC Version 1.2: Supports 1 CPUs and 26 interrupt sources. Just follow the usual procedure to install a NetBSD system. After a successful installation you want to make the system boot standalone when switched on, without the need for a serial console. So you have to modify the bootcmd in U-Boot's environment and write the altboot.bin binary to the Flash ROM. To find a suitable place in the Flash ROM you can use the flinfo command and look out for empty sectors (E). On my StorCenter I have chosen 0xffe80000. Replace that in all the following commands if you have chosen a different address. The \ is important for setenv not to misinterpret the ; as the end of the command. Have fun with your mini NetBSD server!